An Afghan migrant has been jailed for life in Germany after murdering his girlfriend because she refused to convert to Islam. 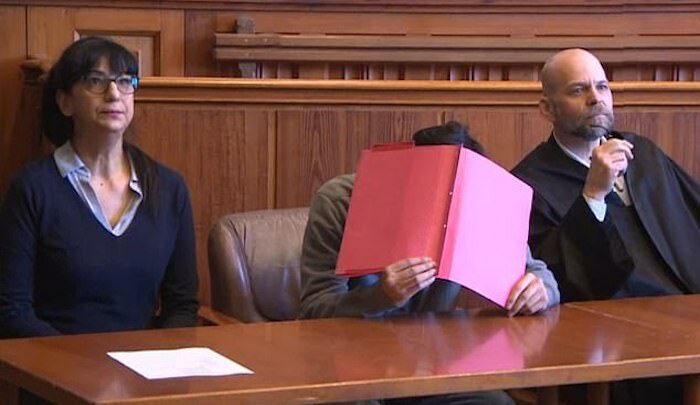 The asylum seeker, identified as Ahmad S. due to German privacy laws, was found guilty of stabbing 17-year-old girlfriend Mireille 14 times at her flat in Schleswig-Holstein in March last year because she ended their relationship. The court heard how Ahmad S turned out to be 11 years older than he claimed, after he arrived in Germany seeking asylum as a minor in 2015 – arguing he was just 18. According to the court, the Afghan migrant was jealous that she found a new boyfriend and hated that he could no longer control every aspect of her life. Ahmad S. denied the murder in court and claimed that someone else must have committed the act. He was found guilty on murder charges by the district court of Flensburg in the northernmost German state of Schleswig-Holstein. He arrived in Germany in 2015 as unaccompanied minor refugee and filed for asylum – which was rejected. Ahmad S. claimed that he is currently 18 years old, but the court had doubts and ordered an age test. Forensic expert Sabine Gumpert testified at the start of the trial that Ahmad S. was at least 21 years old and that her examination strongly suggested he could even be 29 years old. As a result, the court sentenced Ahmad S. according to adult law instead of juvenile law, which in Germany is customary for those under the age of 21 and would have barred the judges from putting him away for life.